Brilliant sunshine and flat calm pretty much the entire weekend. Obviously not a lot of constructive work got done as a result. It's about time that wind generator got installed. What with one thing and another, it's just not happened until now. Again, like so many things, I find myself thinking 'I should have done that ages ago'. For the first time in a long while, I've not had to run a generator over the weekend. Except, of course, to do the welding up the mast. My expectation is that with a reasonable wind, I should not have to use a generator for domestic and most work on the boat over a weekend. Obviously for calm days and power intensive jobs, such as rust busting, I will still need to use a generator. You can just see the outline of the top of this boat's wheelhouse below the water there. Even it's wooden tender is sunk. It's a little sad really, seeing the slow demise of this abandoned boat. 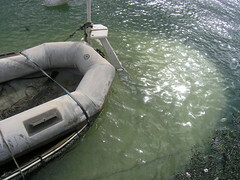 This boat finally sank just a few days before this picture was taken. As the tide goes out, so it reveals itself again - looking progressively sorrier. You could bet that, although abandoned, the owner would soon show up if someone else adopted this boat and started doing something with it. Not that anyone would want to at this stage. You are looking at the underside of the rib - after a first jet wash.
Those barnacle thingies are super tough, and sharp! The jet wash does get the barnacles off, eventually, but you have to blast each one individually. After they come off, they leave a small patch of 'cement' behind which I just cannot get off. I'm obviously paying the penalty for keeping the rib in the water for so long. I have no doubt this job would not be nearly so tough if I did it more regularly. I don't think much of that antifoul either. Now here's a project which must gobble up fifty pound notes like they are Smarties (hundred dollar bills like they are Dots for you guys in the US). This dry dock is right opposite where Lady Jane is moored, so I've been watching the progress on Nobli, originally named Lac II, for over a year now. 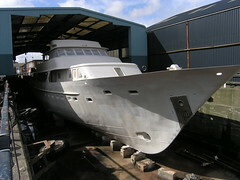 This Feadship boat, previously owned by President Gaddafi of Libya, has now been extended somewhat. All I know is it's taken what seems like ages to get this far and, so far as I can tell, the inside is still a complete shell. Apparently absolutely everything inside had Gaddafi's crest on it, even the light fittings, so the new owner presumably had little option but to strip it all out and start again. That or adopt Gaddafi's crest! As you can see from the picture, she has recently been shot blasted and spray painted. By the look of her, she's now ready to float for her stability testing. Owning a boat means work. There is just no getting away from it. A slow weekend pottering about on board Lady Jane gives me the opportunity to waffle about some of the other boat projects going on right by me. 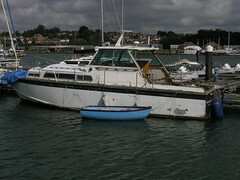 Here you see a venerable old boat, kept at the marina near me, which has recently changed hands. In the last few weeks, the new owners have enthusiastically started on her restoration. It will be interesting to see how they get on over the coming months. This has been a bit of an ongoing saga. At the back end of January, the wind generator suddenly quit working. After one call with the folks at Eclectic energy, I returned the generator to them - some two years after their normal one year warranty runs out. A few weeks later, my generator was returned. It had been completely rebuilt - all for free. The expectation is that this will now run trouble free for years to come. I cannot say often enough just how much I appreciate dealing with companies such as Eclectic energy, who stand by their products and their customers. Anyway, the saga really started after getting the generator back. 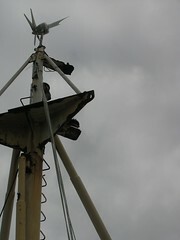 The issue not being with the generator itself, but in getting the generator re-installed atop of Lady Jane's mast. First there was the weather - I had a spell of months where it was forecast wet and/or windy on the weekends, so getting the generator up was impossible to plan. With an improvement in the weather, Robin has seemingly disappeared. So no progress there either. I've been doing other welding on bits and pieces, so feel confident enough to go do it myself now, although I would still prefer it was properly done. 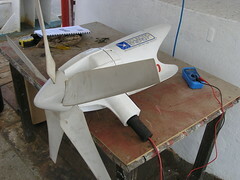 The picture shows the generator all assembled and tested, though not yet cleaned. With the rib out of the water, I need something to get me between the shore and Lady Jane. Enter the new boat, thanks to eBay, which has almost immediately been christened The Old Sow ,by Patch, on account of it's a pig of a boat. That song is stuck in my brain now! The second hand 15HP Honda engine I got with it has an accelerator control which behaves more like a switch - no power or full power! Added to which, the Old Sow seems pretty hard to control with any wind about. Even at full throttle, the Old Sow won't get up on the plane. 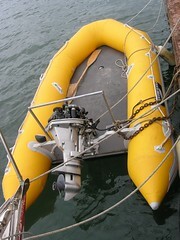 Somewhat of a disappointment for such a light boat and a 15HP engine. Anyway, as it turns out, the Honda engine is not pumping cooling water through the engine like it should. What I've had to do is change the 15HP Honda for the old 4HP Mariner which originally came with Lady Jane. Oddly enough, as I discovered when running the Old Sow up the river where I saw Seb, if I sit right forward in the boat the 4HP engine eventually gets the Old Sow up on the plane. It's a struggle though. I'll have to add the Honda to the pile of things to fix at home. Hmm, from 85HP down to 4HP - what a come down. The rib's finally out of the water and back home. This has been overdue for a while now, as that rib has been in the water for well over a year (a year and four months I see). The need to fix the steering has just moved this up in terms of overall priority. 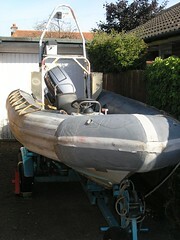 The rib smells somewhat strongly of the sea at the moment, so a good clean is in order before anything else gets done. The seat and that troublesome bilge pump are also crying out for my attention. 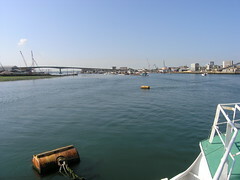 Finally, before the rib goes back into the water the engine, which has been so reliable, also deserves a thorough service.